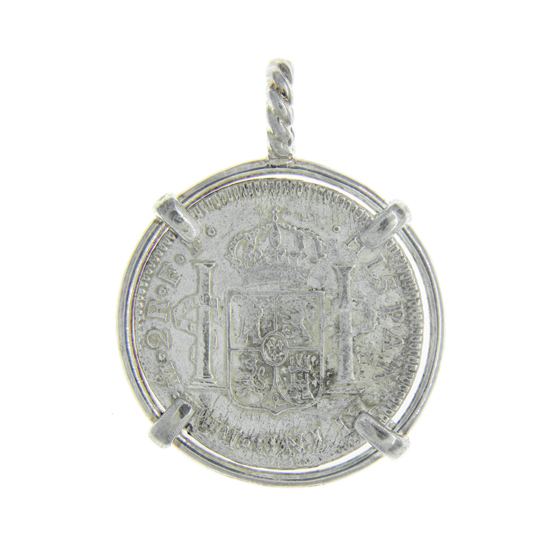 Spanish Silver Bust Coin Pendant - El Cazador Shipwreck - 2 Reales in sterling silver frame. Certificate of Authenticity. Coin Type: SPANISH BUST. Date: 1783. Denomination: TWO REALES. Assayer: FF. Ruler: CARLOS III. Metal: SILVER. Framing: STERLING. Mint: MEXICO CITY, MEXICO. Source: EL CAZADOR SHIPWRECK. Obverse: Draped bust of Carlos III, inscription around: DEI GRATIA (By the Grace of God), date, CAROLUS III. Reverse: Crowned arms of the House of Bourbon sided by the Pillars of Hercules, assayer and legend around.